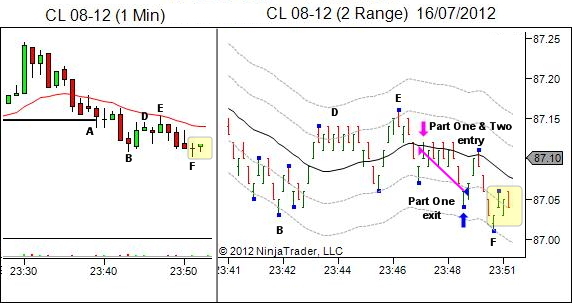 Price stalled post-entry but then fell easily to the first target. 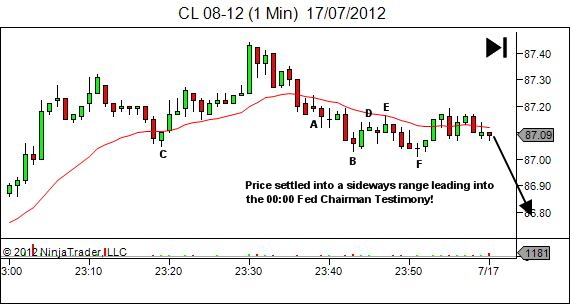 Price reached a new low at F, again by only two ticks, before entering a two minute stall shown in the yellow shaded region. 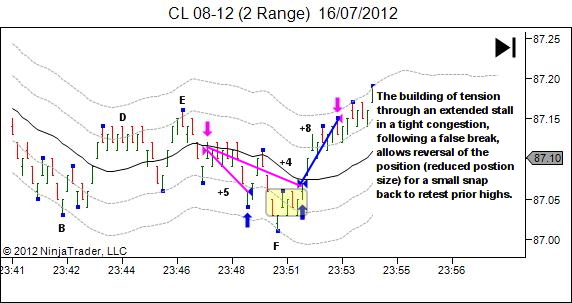 Active trade management requires that we monitor price action bar-by-bar in order to confirm that its behaviour continues to match our premise. A true bearish sentiment should have pushed price much lower, driven by longs stopping out and new shorts chasing breakout profits. This didn't occur. Price held above the 87.00 level indicating greater demand at this level than I anticipated. When the premise is threatened (but not immediately indicating danger) the plan is to work an exit through movement of either the stop and/or target. 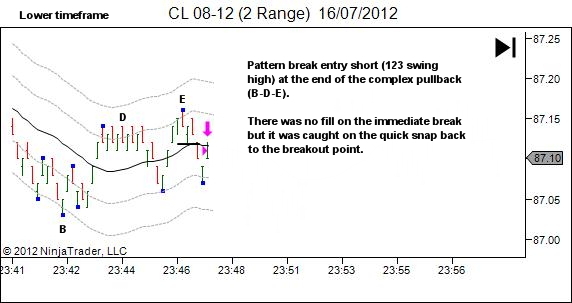 In this case the stop order for part two was moved to just above the stall region. 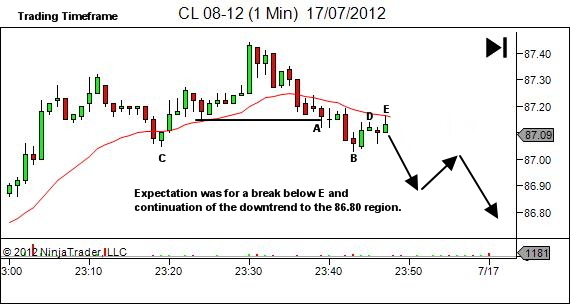 The target remained in its original location on the odd chance that the stall did break downwards. Two minutes stall though is a lot of time to reassess. There is obviously a lot more demand at the swing low C / 87.00 level than I had anticipated (I know… with hindsight it's obvious as the swing low C looks a great level… but my expectation was that it would break). This thing is not going down. So I want out if price breaks above the current stall region. Why the stop and reverse though, rather than just stop and exit? Simply due to the tight nature and the extended duration of the stall following the breakout failure at F.
Whenever you get price action that builds up tension like this, expect a directional move on breakout. Other people like me, operating on these short timeframes and trapped in a short position, are swearing at their screens, willing this thing to keep falling. They're all going to exit if price rallies and breaks the high of the prior two trading timeframe candles. This built up tension, combined with a vacuum above, will allow at least a pop back up to retest the vicinity of D/E. So that's my criteria for a stop & reverse… finding myself stuck in a tight little trap that builds stress over an extended period of time, and allows entry with small risk, on a break of a significant trading timeframe candle. And they're held only with expectation for a retest of prior swing highs or lows; never with any thoughts of a complete reversal.